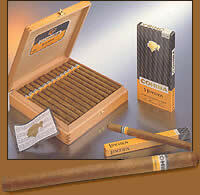 We guaranty authentic cuban Lanceros Bn cigars. It's a marvel of nature transformed into a work of art by the best torcedors. The most elegant Havana is not for smoking anywhere anytime. Rich taste due to the professional presentation. The good quality of the cedar wood used and the fact that the box is varnished give off an exquisite scent when you open the box. However, this presentation has an inconvenience, it stops the procedure of aging, so keep the box a little bit opened in your humidor if you conserve your cigars in their original boxes - which is highly recommended-. When it's "raw", the Lanceros delivers a dark honey taste with a lot of cedar-spicy notes.